Series 1610 provides resettable alternative for plug-in type blade fuses for fuse blocks found in vehicles with 12 or 24 V electrical systems. Color-coding scheme corresponds to colors of blade fuses compliant with DIN 72581 and SAE J1284 standards. Available in current ratings from 6-30 A up to 32 Vdc, circuit breakers will not cause nuisance tripping and are suitable for protecting fans, windshield wipers, lights, and power windows. June 7, 2004, Chicago, IL - E-T-A Circuit Breakers announces the 1610 Series thermal circuit breaker with new color-coded housings. A resettable alternative for standard plug-in type blade fuses for fuse blocks in vehicles with 12V or 24V electrical systems, the 1610 Series circuit breaker reduces downtime caused by blown fuses in trucks, recreational vehicles, speciality vehicles, passenger cars and boats. A new benefit of the 1610 series is a color-coding scheme that corresponds to the colors of blade fuses compliant with DIN 72581 and SAE J1284 standards. Color identification simplifies maintenance and repairs, reduces errors, and increases efficiency. The 1610 Series circuit breaker is available in a wide range of current ratings easily identified by color: dark green (6A), honey (8A), red (10A), blue (15A), yellow (20A), pearl (25A) and light green (30A). 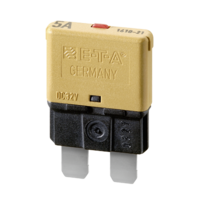 Compared to a traditional fuse, E-T-A's 1610 Series thermal circuit breaker offers numerous advantages: o Unlike a fuse, it can be quickly reset, enabling the circuit to be restored with a minimum of downtime. o It eliminates the possibility of a fuse being replaced with another fuse of the wrong rating. o Circuit breaker performance is consistent over time, but as fuses age, their trip characteristics change. This may lead to nuisance tripping and increased downtime. o Thermal circuit breakers are able to discriminate between in-rush currents and sustained overloads; fuses cannot. o Fuses cannot be tested without destroying them. The operator can never be sure the fuse specified will open if there is an overload. The 1610 Series circuit breaker reliably protects various loads including fans, windshield wipers, lights and power windows. It may be ordered with or without a manual release feature. The manual reset button is ideal for service and maintenance, allowing repeated and safe disconnection/reconnection of individual circuits. This resettable circuit breaker is fully interchangeable with blade type fuses, offering ease of fuse replacement and precise replacement parts. When substituted for a fuse, the E-T-A 1610 Series breaker offers standard current ratings that will not cause nuisance tripping if properly specified. E-T-A's 1610 meets SAE standard J553 type III (manual reset) and type I (automatic reset) and is available in current ratings from 6 to 30A up to 32V DC. Price and Availability E-T-A's new 1610 series is available from stock. Priced around $6 in medium production volume (500 to 1000 units). For more information call E-T-A at 847-827-2700, or visit www.e-t-a.com . About E-T-A E-T-A Circuit Breakers is the world's leading manufacturer of circuit breakers for OEM equipment and is the only resource for all circuit protection technologies: thermal, thermal-magnetic, magnetic and high performance. E-T-A circuit breakers are available in more than 150 models and 350,000 different configurations. E-T-A is also a world-leading manufacturer of control and monitoring products, and solid-state remote power controllers (SSRPCs). With the North American headquarters in Chicago, the company serves industrial OEMs and end-users.